OK, so knowing that S2D works with DAS storage only it is time to test and verify if it’s difficult to build an S2D cluster. To build the cluster, I’m going to build one using this guide. I use 2 FS1 Azure VMs and attach one P10 disk to each node. So I follow the steps to build the cluster. Thir fist step is to enable S2D which works fine. NOTE: as in my previous post, the CacheMode parameter is not there. While this is still in the guide it may be a bit confusing to read it. The next step is creating a Storage Pool for S2D. Hmm, that’s odd. Appearantly 2 disks is insufficient. So, let’s add two more, one at each node resulting in having four disks. The final step is creating a share according to the guide. Well I was able to create the share using the Failover Clustering Console by configuring it as a SOFS and provide a ‘Quick’ file share. Windows Server 2016 is available for a little while now. A well-hyped feature is Storage Spaces Direct (S2D). 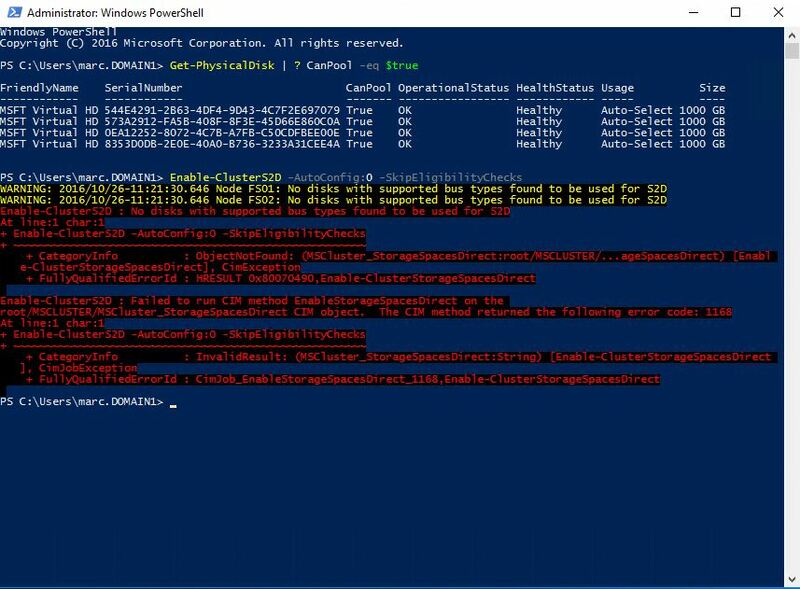 It allows organizations to create fast performing, resilient and hyperconverged clusters which will go hand in hand with Hyper-V. Based on the documentation available at https://technet.microsoft.com/en-us/windows-server-docs/storage/storage-spaces/storage-spaces-direct-overview it even allows to run Hyper-V and SOFS on the same hardware without requiring expensive storage components such as SANs and the additional components required to connect to it. This is a major improvement compared to Windows Server 2012 R2 which doesn’t support this. Okay, that makes sense since S2D eliminates the need to for remotely available storage. Seems like it works with DAS only. But what if I still have a bunch of iSCSI targets available and would like to use them for an S2D cluster? Maybe the Volumes provided by a StorSimple device might work, after it’s iSCSI too, right? Since I don’t have any hardware available I decided to build the cluster in my Azure environment. The first thing I did was verifying if the 4 disks can be pooled using the Get-PhysicalDisk | ? CanPool -eq $true cmdlet. They can. This error confirms that locally attached storage is required to use S2D, so this is a dead end. iSCSI disks are not supported. It’s been a while since I posted my previous blog post. The main reason I didn’t post anything for a while is that I was very busy personally and professionally. I’ve been helping out customers adopting the Public Cloud more frequently and I must admit it’s a lot of fun. “Yeah, it’s very nice this Microsoft Azure and all that other gay stuff, but how much does it cost? Provinding an answer for the first question is quite challenging because Microsoft provides the Azure Pricing Calculator (available at https://azure.microsoft.com/en-us/pricing/calculator/) only. It allows me to provide an estimate on how much it will cost an organisation to use Azure services. It is still an estimate and that’s problematic because I cannot really use it for any TCO calculation. TCO is something that a CFO looks at and he or she wants the TCO to be a low as possible. All I could find was an old post available at https://azure.microsoft.com/en-us/blog/windows-azure-platform-tco-and-roi-calculator-now-available-online-and-offline/ but the tools are not there anymore. The fun part of is that many organizations have no idea which costs they have and if they do, taking them in the equation. This behaviour will automatically cause the second question to be asked. I’d like to see Microsoft deliver a tool that allows me to fill in these variables. Microsoft’s biggest competitor, AWS, has such a tool. Sounds like quite a rant to Microsoft, right? If you look at it like this, then adopting Cloud Services may not so expensive at all. Additionally, tunnel vision can be created when looking at costs alone. Many times a small increase in costs may greatly increase the benefits adopting Azure Cloud Services and I’d certainly recommend it in most cases. The only case I wouldn’t recommend it is having a workload with almost no fluctuations.